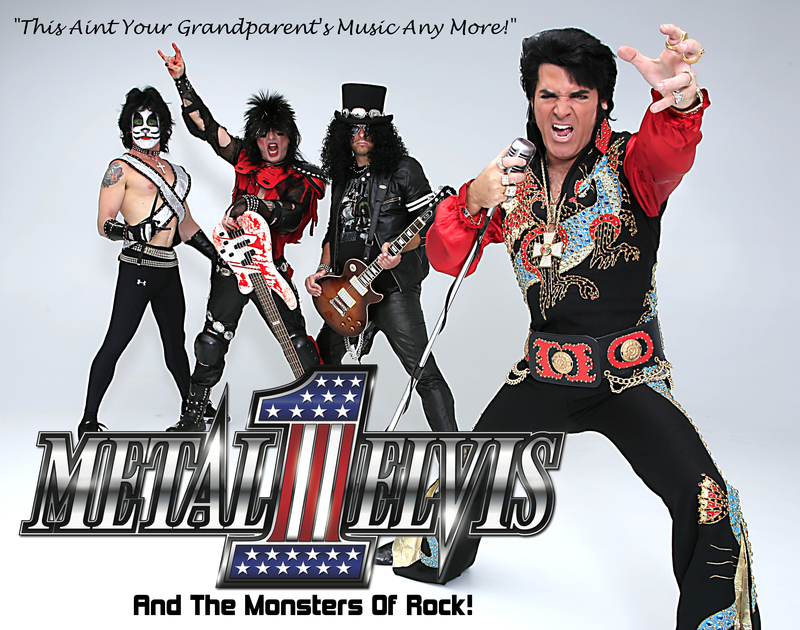 Las Vegas Bands - Metal- Elvis Tribute band book them now! A Hard Rock Salute To Elvis Presley. As seen at the Las Vegas HARD ROCK CAFE, THE PALMS, THE RIVIERA ,Also the 2012 winner “Best Las Vegas Hard Rock Tribute Band” through Vegas Rocks Magazine. Also considered a “mash-up band” THE METAL KING blends 1980’s rock with Elvis classics. The band is comprised of impersonators portraying ELVIS – vocals, SLASH – guitar, NIKKI SIXX – bass, PETER CRISS – Drums. You can book Metal Elvis for your next event just by clicking the "Book Them Now" button to the right and filling out the form. We will be in contact with you about their availability as soon as possible. Book Them Now ! !